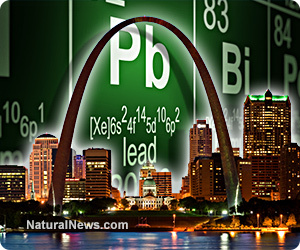 (NaturalNews) There is an epidemic of lead poisoning in the "rust belt" city of St. Louis, where hundreds of children annually are diagnosed with the condition, according to new reports. The St. Louis Department of Health (SLDH) says that, while city-wide efforts to reduce lead exposure have been moderately successful, many children are still encountering lead from aging buildings, dust and other silent sources. St. Louis Public Radio reporter Camille Phillips reports that more than 1,000 cases of elevated blood lead levels are reported annually in the city, and that parents need to be aware of potential sources of exposure. Since much of St. Louis' housing stock was established prior to 1978 when lead-based paint was banned at the federal level, many homes still contain it -- and continued deterioration of these homes and their materials is potentially releasing more of it than ever. "We've been on a long battle," stated SLDH Health Services Manager Jeanine Arrighi to St. Louis Public Radio. Arrighi and her team have perpetuated a local program that was first started back in the 1940s to address lead exposure. They say lead poisoning rates have dropped by some 80 percent over the last decade as a result, which has helped many a child avoid developing low IQ and other health problems associated with lead exposure. But there are still way too many children whose lives are being destroyed. "At 12 months my child was saying all kinds of words, and mimicking and babbling," says Lisa Kahrimanovic, a St. Louis resident who learned the hard way what lead poisoning can do to a person. "But at 15 months he actually stopped talking, stopped mimicking. His eye contact was reduced. And I was concerned." At the time, Kahrimanovic had no idea that the paint on the window sills and door frames in her and her husband's brick home contained lead. Though she knew that something was definitely wrong with her son, Kahrimanovic assumed it to be a behavioral disorder or, in a worst case scenario, autism. But a subsequent blood test revealed the truth, that the body had come into contact with lead. Local resident Tamara Rubin had a similar situation with her children, all of whom were exposed to lead back in 2005 when the family decided to remodel their older home. When the children's symptoms indicated lead poisoning, Rubin decided to take up the mission of becoming an advocate against lead poisoning, leading her to produce a powerful documentary on the subject. "I made the film because I wanted people to see that this is still happening," explained Rubin to St. Louis Public Radio about the film, entitled MisLEAD: America's Secret Epidemic. "People really don't get that this is still happening. The paint that was applied in the 1920s, 30s and 40s was applied to last a hundred years, and it has. And in a lot of those homes, it's deteriorating now for the very first time."